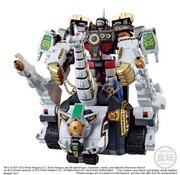 As the 3rd release of Super Mini Pla series from Power Rangers, "Titanus" has arrived. You can enjoy not only Carrier Mode and Attack Mode but "Ultrazord" by combining with Megazord (*sold separately) and Dragonzord (*sold separately)! Batteries not included. Takes 2 AAA batteries.